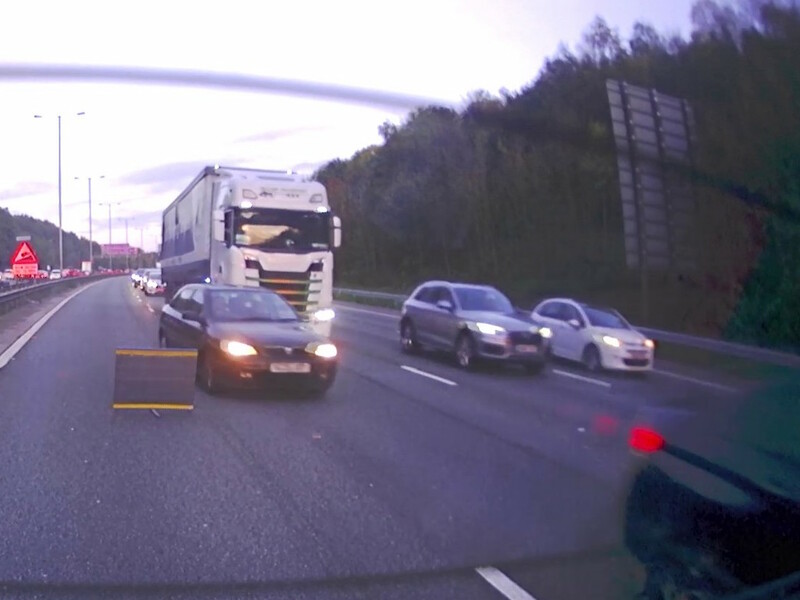 Footage of a car narrowly avoiding a collision in a red X lane on the M60 has been released by Highways England as part of its campaign to educate on smart motorway usage. Latest stats show that one in 10 drivers are ignoring ‘red X’ signs on the North West region’s motorways, with many waiting until they reach an incident before changing lanes. This is backed up by the CCTV footage, which shows the driver’s near miss with an HGV on the M60 near Whitefield. The vehicle had been travelling along a lane closed by a red X and moved over just seconds before reaching two Highways England traffic officers who were helping the driver of a broken-down car by the central reservation. Traffic officer Ben Cookson is based at Highways England’s Milnrow depot and was one of the officers who responded to the incident. He said: “We’d done everything we could to keep everyone safe by stopping behind the broken-down car with our emergency lights flashing, putting out an incident sign and displaying red Xs to close the lane but there were still drivers leaving it until the last few seconds before pulling in. The release of the footage comes a fortnight after RAC research showed one in four drivers in the UK are still red X lanes despite the dangers. In addition, drivers can receive a £100 fine and three points if they are observed driving in a closed lane. Work is also underway to ensure automatic enforcements of the signs; in 2017 the Government amended the Road Traffic Offenders Act to enable red X offences to be captured by a remote or automated device, but legislation still has to be completed before the technology can be used in enforcement.